The Ilminster Midsummer Experience (IMEx) has been running since 2008 and is now firmly established as a major tourist attraction, drawing people from far and wide to our historic town. There are dozens of events covering the arts, music, exhibitions, fun shows, markets and much, much more. 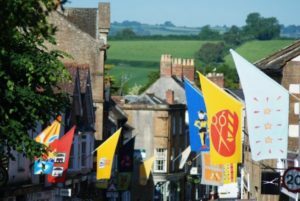 Many visitors come to see the famous Ilminster Flag Festival that runs for 4 weeks from the end of May. This colourful event celebrates many of the town’s businesses and organisations with over 100 flags throughout the town including stunning banners designed by Patrick Reytiens and John Reytiens in the Minster grounds. There is sure to be something to appeal to all members of the family . Everyone is welcome, so come along to enjoy and participate in the extraordinary Ilminster Midsummer Experience. Take a look at our program of events and make us part of your summer activities and click here to view the 2018 leaflet, a 2019 leaflet will be uploaded soon.